EU offers October 31 Brexit extension date. Halloween night. Coincidence? I think not. Brexit extension to October 31. Review in June. UK to take part in EU elections. As the headline says, the currency response was limited. Cable has seen little more than a 15 point or so range since the announcement and is currently sitting just under 1.3100. EUR/USD has done even less, barely changed from around 1.1275. Trump not happy with the EU - "a brutal trading partner with the United States"
On the RBA - "Debelle poured cold water over near-term rate cut hopes"
AUD traders - election will happen on May 18. This time there is AUD risk. News and data flow was non-impactful for the session. 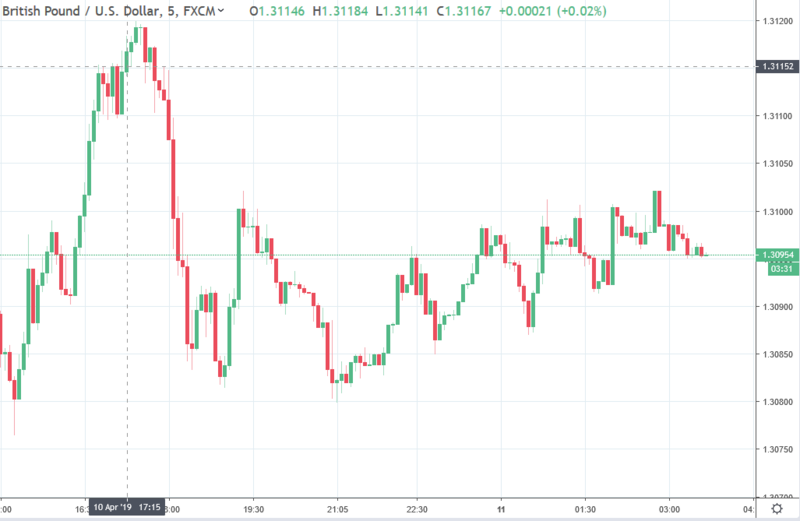 The talk of an Australian election to be called today (May 18) was out on Forexlive during the US session and was confirmed here, the PM did indeed call the election for the rumoured date. AUD and NZD have been small movers, both off a few points. China's March inflation data came and went without too much of a ripple, the data coming in as expected. USD/CAD has been a star in the lacklustre field today, its up 20+ points. Oil is a touch lower on the session which will be an input into the CD losing a few points. Gold is down just a touch also.